This Low Carb Pumpkin Crisp is the ultimate holiday recipe to make this year and every year moving forward! 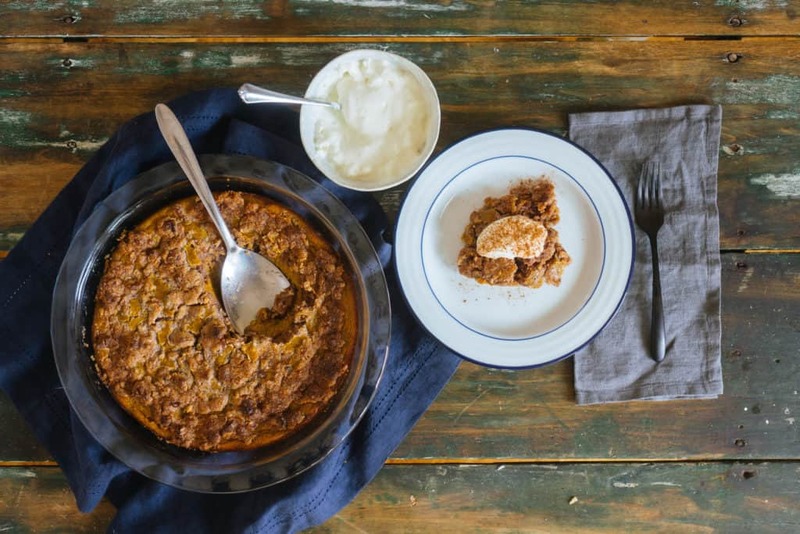 It combines the deliciousness of a pumpkin pie and an apple crisp and it will fit perfectly into your low carb diet. Being keto doesn't mean missing out on delicious holiday recipes. When the holiday season rolls around and it's your turn to host, we've got you covered! We've been making low carb holiday recipes for a total of three years now and we have everything from desserts to sides dishes. However, if you're like us and celebrate Thanksgiving solo or just with a small group of people you can make our bone-in turkey breast and gravy recipe so you're not left with 12 lbs of leftover turkey! While not traditionally a holiday recipe, my favorite dessert that I highly recommend you make is our Keto Butter Cake! Our Favorite Low Carb Pumpkin Recipes! If I can be honest for a moment, I'm not a huge fan of pumpkin. When given the option of pumpkin spice or chocolate flavoring I'm going chocolate all the way. That being said, we do have some incredible pumpkin recipes for the holiday season and all you pumpkin lovers! My favorite, aside from this crisp, has to be our mini pumpkin cheesecakes! They are the perfect appetizer or dessert to start off any holiday gathering. If you're looking for a low carb side dish we have a sweet potato casserole that uses pumpkin pie puree and mashed cauliflower! Don't knock it until you try it - it tastes like the real thing! And, if you're just looking a for a quick dessert to top off the night we have an easy pumpkin pie mug cake you can make in under two minutes! Don't forget about yourself this holiday season. Being around all the desserts, alcohol and loved ones can make sticking to your new lifestyle difficult. Sometimes you just have to put yourself and focus on how far you're come. 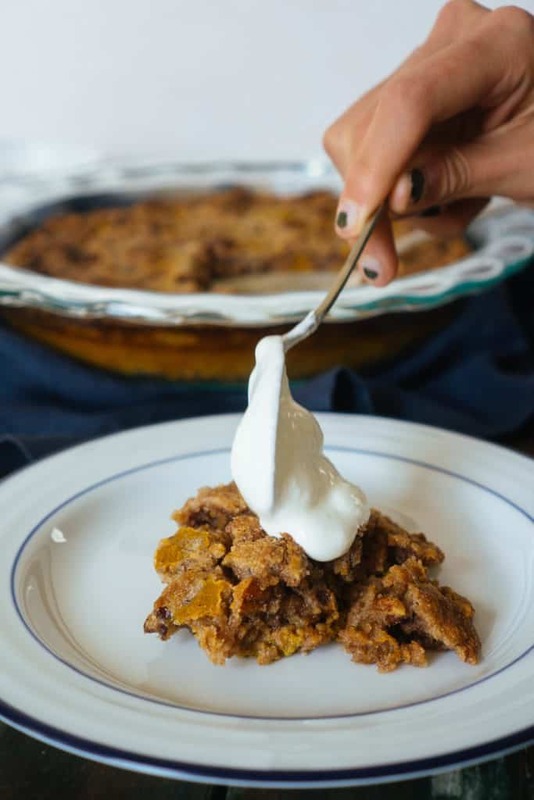 You can enjoy holiday dessert this year and still stay on track with this low carb pumpkin crisp! 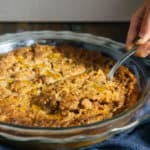 Recipe can be quickly added to MyFitnessPal - Search "KetoConnect - Low Carb Pumpkin Crisp"
Preheat your oven to 350 and grease a 9 inch pie pan/brownie pan. Combine all the filling ingredients in a large bowl and whisk until fully combined. Pour into the greased dish and bake for 10 minutes. While the filling is baking make the topping. Add all the topping ingredients to a medium bowl, except the butter and combine. Add the cubed butter to the mixture and combine using your hands. The mixture should turn into a sandy, dough like mixture (as seen in video). Break apart the crumble and plop on top of the slightly baked filling. Bake for 27-30 minutes or until topping has browned. Allow to cool for 5 minutes prior to serving. Note: Can be served hot or cold!